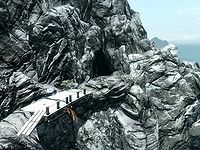 Rimerock Burrow is a small cave located at the northwestern edge of Skyrim. 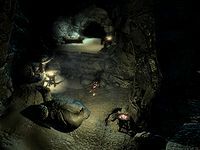 The sole occupant of this cave is a powerful mage, Sebastian Lort, who can summon leveled atronachs and wield exceedingly powerful lightning spells. It is advisable that you ensure you have a light source before entering. The path leading to Rimerock Burrow takes you over a wooden bridge spanning a crevice in the cliff wall just before the entrance. It is found on a fork off to the right of the path leading to Pinefrost Tower that is marked by piles of rocks on either side, it can still be easily missed as there is likely to be an encounter as you near the junction. Upon entering, there is a dark tunnel leading in the main cavern, on the lowest level. There are raised levels in front and to your right. There is a leveled atronach patrolling from the raised area to your right down to the lower level. This area contains nothing of interest. Sebastian will be found on the raised area in front of you, normally working at the arcane enchanter. To get to Sebastian, you will have to climb a ramp on the far left of the cave against the wall. There is a large stone table on your left with an arcane enchanter near it. On the table is a scroll of conjure familiar, a steel dagger, a goblet and a bowl containing a sample of nightshade and a pine thrush egg. If sent here by Clavicus Vile, the Rueful Axe will also be lying on the table. If you are prior to the related quest the Rueful Axe will be replaced with an ordinary steel battleaxe. Between the table and arcane enchanter is a tunnel heading south, then west that leads to a storage and bedroom area. On your right before reaching the end of the tunnel is Sebastian's bedroom containing a single unowned bed, with an end table next to it. On the table is a copy of the Conjuration skill book 2920, Hearth Fire, v9, an apple pie, a sweet roll and a bottle of wine. Next to the end table are two barrels, one of which contains ingredients, a rabbit and some dried elves ear are hanging over them. Just after the bedroom area is an unlocked chest containing leveled loot and any items you are sent here to recover. At the end of the tunnel there are two sets of shelves. The shelves hold copies of The Firmament, Darkest Darkness, The Wolf Queen, v2 and v5, The Real Barenziah, v2, Dwemer Inquiries Vol I and Vol II, Pirate King of the Abecean, Ruins of Kemel-Ze, The "Madmen" of the Reach, The Song of Pelinal, v1 and v6, Biography of Barenziah, v1, two copies of v2 and one of v3, A Kiss, Sweet Mother, The Firsthold Revolt, A Children's Anuad, The Ransom of Zarek, A Dance in Fire, v4, Myths of Sheogorath, Brief History of the Empire, v2. In addition to the books there is also a sample of snowberries, a filled petty soul gem, two bowls, a salt pile, a bowl of bone meal, a large coin purse, a troll skull and a set of small antlers. Between the shelves is a barrel containing ingredients. Despite being a werewolf lair, no werewolves can ever be found in the dungeon. Sebastian Lort respawns along with the rest of the cave. Rimerock Burrow isn't marked as a cave, so cave-based radiant quests won't target it. This page was last modified on 20 January 2018, at 17:27.